Consuming memory boosting foods not only improves our ability to remember, it also diminishes our likelihood of developing cognitive disorders. And the latest food studies are proving why. For example, in July 2018, new research was released by an international team of scientists from Quebec. They studied 215 people, age 60 to 70 years old. It was a placebo-controlled, double blind, randomized clinical study that lasted 6 months. In that period, a random group of subjects received a polyphenol-rich extract of grapes and blueberries while others received a placebo. 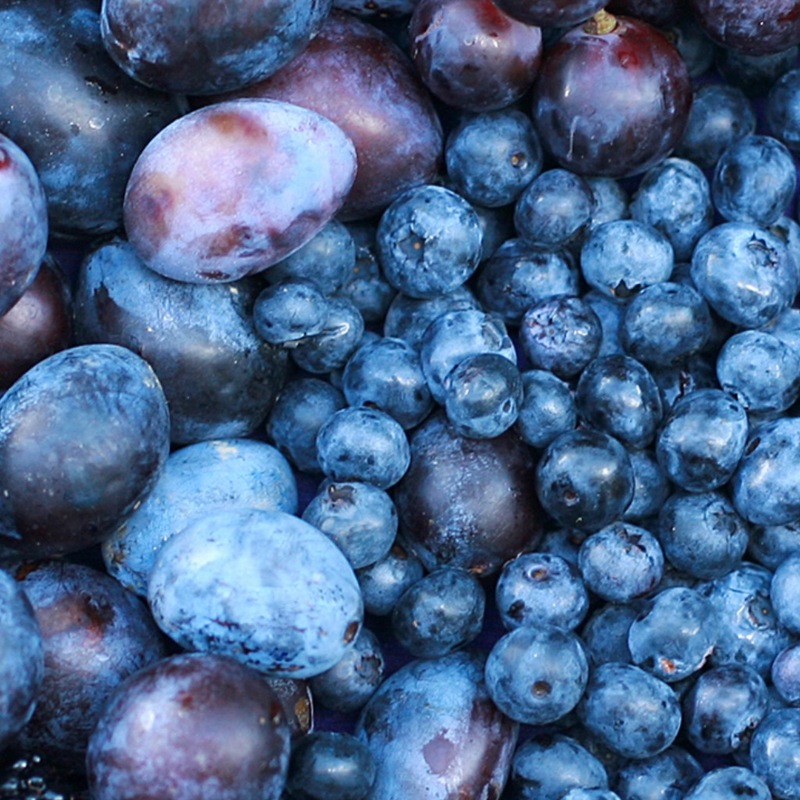 In this case, the group who received the grapes and blueberries were already showing cognitive decline. Blueberries have always been in the top 10 of memory boosting foods, but what this study proved was that when grapes and blueberries are combined, your memory improves. Yet another study was performed on mice. That study also showed that combining blueberry and grape polyphenols prevented learning and memory deficits caused by aging. Therefore, I would recommend to anyone concerned about memory loss and cognitive problems to include a mix of dark red grapes and blueberries in their diet every day. For example, I came up with this memory boosting foods combination in the form of muffins. 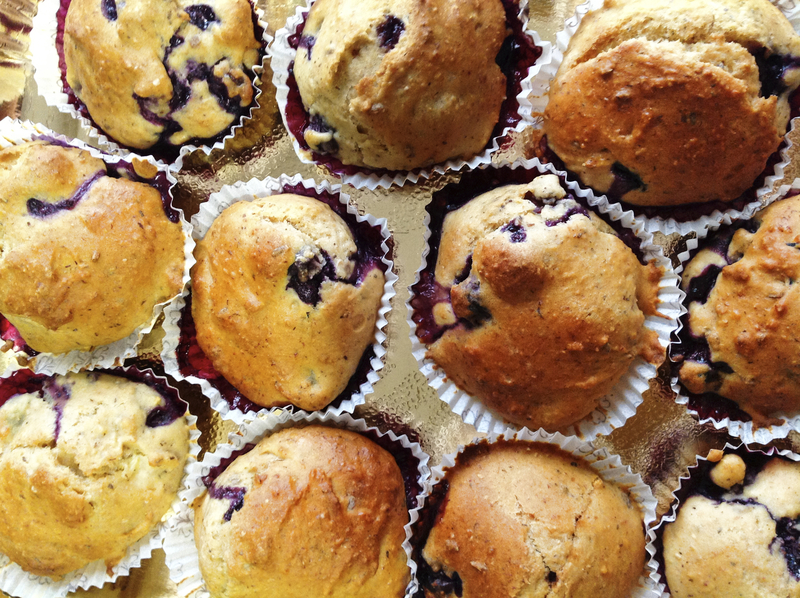 Healthy muffins are a wonderful grab-n-go snack especially when you freeze them individually. Furthermore, I would also recommend including 3 servings of leafy greens to your diet every day. A serving is one cup raw or 1/2 cup cooked. Many studies indicate that the consumption of leafy green vegetables is associated with a slower rate of cognitive decline. Researchers from the Memory and Aging Project followed 960 participants over 5 years. The team focused on the level of consumption of green leafy vegetables, like spinach, collard greens, kale and lettuce. The average age of the participants was 81-years old, and all were dementia-free at the beginning of the study. Over 5 years, participants underwent an annual array of tests that assessed episodic memory, working memory, and semantic memory. When the study was over, they discovered that people who consumed 3 servings a day of leafy greens had significantly slower cognitive decline. Not only that, the rate of cognitive decline among those who ate 3 servings of leafy greens a day, was the equivalent to being 11 years younger cognitively. A number of studies have shown that physical activity can have positive effects on the brain, particularly as we age. But new research has found that is may be possible to improve these effects simply by drinking beetroot juice before exercising. The study showed that drinking beetroot juice boosts your stamina and could help you exercise for up to 16% longer. Why? Because drinking beetroot juice raises nitric oxide levels in your body which leads to a reduction in oxygen uptake, making exercise less tiring. Create your own beet juice by adding some roasted, peeled beets to a high-speed blender. Blend on high for 20 to 30 seconds until the beets are completely broken down. Throw in some grated anti- inflammatory ginger for good measure. Turmeric – I recommend a 1/4 teaspoon a day – You can add it to a stir-fry, soups and even tea. Broccoli – Broccoli is packed with antioxidants and vitamin K. Some studies have linked vitamin K intake to better memory skills. I recommend a 1/2 cup cooked or 1 cup raw a day. Pumpkin Seeds – Pumpkin seeds contain powerful antioxidants that protect the brain. Keep them in your car or purse as a healthy snack. Pumpkin seeds are also manganese-rich which can help alleviate anxiety. Green tea – Green tea boosts brain function by improving alertness, memory and focus. It is also rich in polyphenols that can protect the brain from mental decline. Avocado – Containing both vitamin K and folate, avocados can help improve cognitive function, especially memory and concentration. Physical activity is an important part of any overall body wellness plan. Consider physical activities that may be mentally or socially engaging, such as a nature walk with a friend or a yoga class. If you prefer the gym and weight lifting, there are proper lifting belts for vegans available. Unfortunately the foods that can increase our risk of memory loss are common staples in the American diet. Foods like white bread, processed meat and cheese have all been linked to Alzheimer's disease. Also, microwave popcorn can contain dactyl, a chemical that may increase amyloid plaques. Amyloid plaques are found in the brains of patients with Alzheimer's disease. To learn more about brain health and memory boosting foods, listen to my Podcast #35 Brain Disease Symptoms, Prevention and Growing Brain Cells and Podcast #3 The Connection Between A Healthy Gut and Mental Health. Don't miss any of Ordinary Vegan's delicious plant-based recipes by signing up here. If you love muffins as much as I do, check out my Oil & Dairy Free Healthy Pumpkin Muffins and my Oil-Free Zucchini Muffins. Lastly, many people in the wellness world are turning to cannabidiol, commonly known as CBD from Hemp for its powerful anti-inflammatory properties for regulating chronic pain and stress response. No matter what your particular ailment may be, CBD oil from hemp may help. You can now purchase a safe and effective vegan CBD Oil from Ordinary Vegan. My mission is to provide you with the most reliable and highest quality CBD Oil from Hemp on the market. I hope it can help you. A new body of research suggests that eating grapes and blueberries together can showed a dramatic decline in memory loss and aging. Need all the help I can get. I have dou le alleles for Hereditary ALZ is in my genes! I am sorry to hear that Gina and I hope this information can help. You should also listen to this podcast for more information. Thank you! Will try the recipe, always looking for stuff for Hubby with MS.
Any idea how many calories or fat per muffin? Thanks for the info. I want to make these for myself and my 90 year old dad! Roasted beets in the juicer/blender? Aren’t raw beets a better option? Curious to know, as we just got our new juicer and I have beets in the fridge ready to go!! Hi Suzi – either works – I like roasted because roasting gives them a sweetness and caramelization that tastes yummy! Thanks for stopping by and thanks for being part of our healthy community!